U.S. Javelin anti-tank missile systems are not in possession of Ukraine's Joint Forces, Ukraine's Joint Forces commander Serhiy Nayev has said. "Currently, the forces under my command do not possess Javelin missiles," Nayev said during a briefing in Kramatorsk on Wednesday. Nayev added that Ukraine's Armed Forces have long been preparing to use Javelin missiles. "…Preparations began long before we received them in Ukraine," he said. Ukraine's Defense Minister Stepan Poltorak has said the Javelin missiles have been received in Ukraine and that training on them will commence on May 2, 2018. As reported, in early March 2018, the U.S. Department of State approved the supply of Javelin anti-tank missile systems to Ukraine. "The State Department has made a determination approving a possible Foreign Military Sale to Ukraine of Javelin Missiles and Javelin Command Launch Units (CLUs) for an estimated cost of $47 million," a report posted on the website of the Defense Security Cooperation Agency said. It stated that the agency had delivered the required certification notifying Congress of this possible sale. 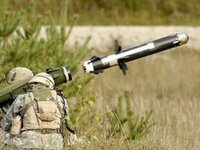 The agency reported that Ukraine had requested to buy 210 Javelin missiles and 37 Javelin Command Launch Units, including two CLUs to be used as spares. "This proposed sale will contribute to the foreign policy and national security of the United States by improving the security of Ukraine. The Javelin system will help Ukraine build its long-term defense capacity to defend its sovereignty and territorial integrity in order to meet its national defense requirements," the report said. It noted that supplies "will not alter the basic military balance in the region." The prime contractors will be Raytheon/Lockheed Martin Javelin Joint Venture of Orlando, Florida and Tucson, Arizona.